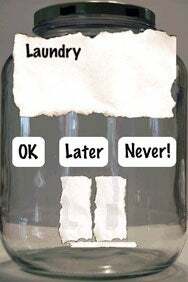 If you’re looking for a way to shake up an otherwise boring to-do list, J’s Job Jar from James Norton offers a relatively easy-to-use way of managing tasks and mundane chores. On the Job: After you shake your iPhone or iPod touch, J’s Job Jar summons up one of the chores you’ve entered. You have the option of doing it now, putting it off, or forgetting about it altogether. Use the app to tap out tasks, chores, and other things that need to get done on virtual slips of paper. These are added to the titular Job Jar—a virtual representation of a jar on the iPhone’s screen. When it’s time to tackle a task, give your iPhone or iPod touch a shake—a job randomly pops up. You have the option to say OK (which means you’ll do the job now), put it off until later (which puts the job back in the jar for another time), or put it off forever (which removes the task from the jar). J’s Job Jar makes it easy to edit your job list whenever you want. You can add and remove jobs at will. If you want to see your full job list, you just tap Jobs on the main menu to view the editable list. The Main Menu appears right after you launch the app. You can select the jar label (the virtual masking tape), and the app will bring up a jar list where you can enter multiple jar lists—a recent addition to J’s Job Jar. You can also edit the name of the jar. The app is fun, though a bit silly. While a clever idea, it’s not much of an improvement over writing down to-dos on a pad of paper. If you want to impose some order on your to-dos, you may find the random nature of J’s Job Jar frustrating. Users looking for a more full-featured to-do manager should probably consider other options. Still, for a simple way of maintaining and completing to-do lists, this app will fit the bill. And it does so in a fun way that’s unique to the iPhone platform.